Safe cracking on the Golden Ghost Ship. Episode 12 of Mouretsu Pirates (AKA Bodacious Space Pirates) gives us the exploration of the Golden Ghost Ship, so beware! Spoilers be ahead! In short, B-Pirates managed to avoid delivering the obvious storyline once again. 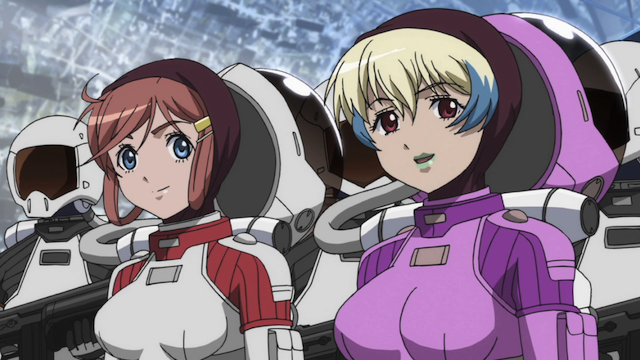 Marika Katou (left) and Misa Grandwood (right). 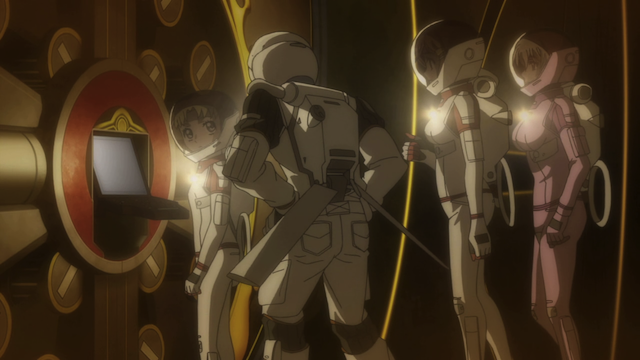 With inconsistent atmospheres, and zero gravity, the crew of the Bentenmaru suit up for EV adventure. The inside of the colony ship. 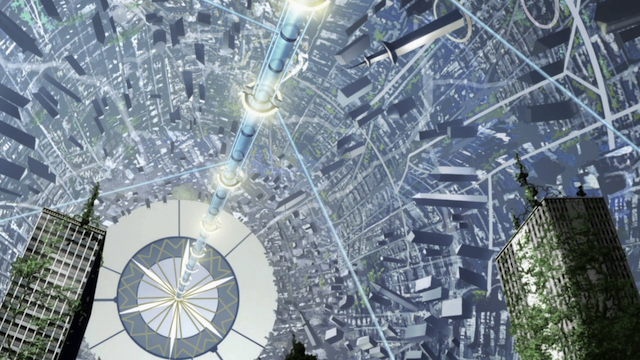 I love these kind of settings where people live on the inside of a spinning tube. As you can see from the image above, the ship is huge, and hi-rise buildings are on every side. Normally the ships walls would be spinning to generate artificial gravity, but they weren’t spinning when the pirate crew boarded, so they had to use gear designed for zero-G movement. 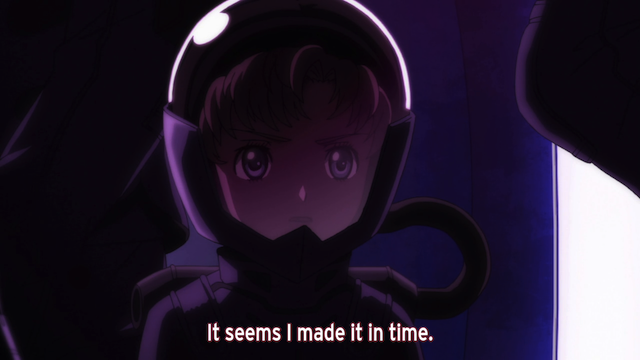 Marika, knowing that the Serenity defense forces have also boarded the colony ship, decides to head straight for the “treasure”, instead of bothering with the engines or the bridge. This show really knows how to subvert my expectations. I was pretty sure at one point that there was some ancestor of the Serenity royal family in the “cold sleep” facility. As it turns out, the sleep chambers are filled with animals as a “back-up” to livestock that was brought on the colony ship to populate the new planet of Serenity. Schnitzer gets to show off a little during this episode. For one thing, he doesn't need to wear a mask or apparently breathe. 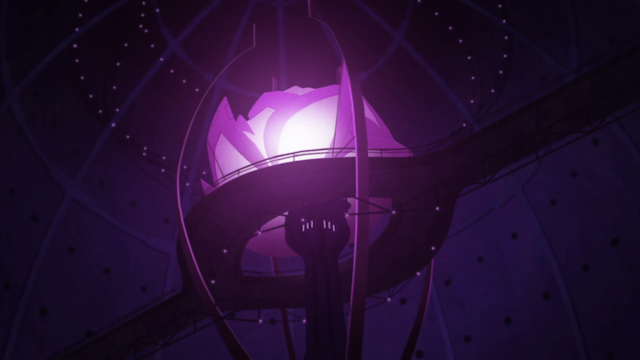 The real “treasure” turns out to be the Rose Spring, an artificial womb, where the first king of the Serenity royal family was born. Grunhilde Serenity. She must be the bad guy because she is wearing black, right? The big surprise is that the rebel within the palace is Gruier! I had been prepared to believe that Grunhilde was being manipulated by (or possibly was the leader of) a faction that wanted to usurp the throne, and that Gruier needed something (or someone) on the ship to take her rightful place as ruler of the Serenity star system. In fact, Gruier’s goal all along has been to DESTROY the royal family! She believes the people of Serenity can live without the royals, and she wants to destroy the Rose Spring, which is both a powerful symbol of the importance of the royal family, and a mechanism for ensuring continuity in their bloodline. (It is possible, though it is not stated outright, that the Serenity tradition is to pass rulership to male heirs, and that only female descendants of the Serenity bloodline are left, thus precipitating a crisis of succession). This was a great reversal for Grunhilde’s character. In retrospect she had a pretty good reason to be angry at Gruier for contracting with pirates to destroy the Ghost Ship. At least from her perspective, she is maintaining the traditions of her family and her people. 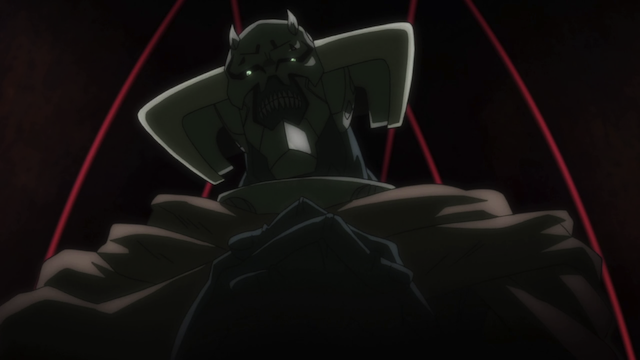 Gruier is threatening chaos, or at the least is being disrespectful to the history of Serenity’s people and her ancestors. What can bring an end to the conflict? In the end, it turns out that Marika’s dismissal of Griuer from the bridge was even more important than it initially appeared. Though the artificial womb is spent, it has produced one more member of the royal lineage. The pirates and the Serenity defense forces work together to bring the original Queen Serendipity out of sub-space (as Coorie says, “making quantum probability theory and multi-d universe theory work within the same space-time string is very difficult,”) and back to the Serenity star system, where the royal sisters make an announcement to their people. I’m a little confused as to where we stand. I have seen many reports that next week is the final episode, but some reports say that the show is going to continue for another course. If this show only has 13 episodes, the next one seems to be an epilogue with life returning to normal. Personally I hope we get an additional 13 episodes, as the writing for this show is very unusual, and has defied my expectations repeatedly. 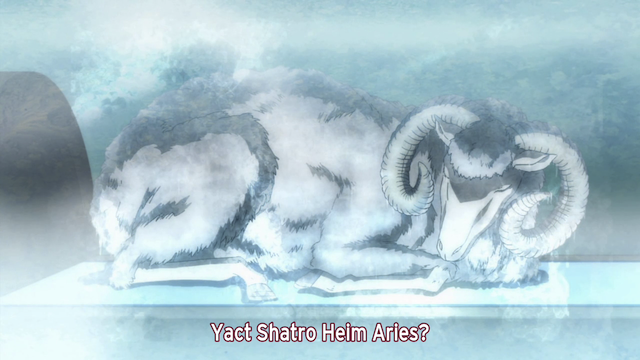 Also, the show seems to have just hit its stride. The characters are now in place, and there certainly are more adventures ahead for Captain Marika and her crew. MAL has it listed for 26 episodes, so I’d say you’re safe there. And I agree, the show took its time, but it’s been paying off as the episode count has gone up. That’s why the second half should be pretty good! Excellent. I want to see the next adventure. I rather like the 6/7 episode arc format they have going. I don’t think I have seen it before, but it makes for an interesting story. No, I’m pretty sure it’s 26 episodes. There was a lot I liked about this episode, but it ended up leaving me a little disappointed. I guess I was expecting a reveal with a little more punch. Also, I was expecting to get a clue from this arc about some wider conflict/tension going on regarding the Galactic Empire and the colony worlds. (This was based on a comment made in one of the opening voice-overs about Serenity struggling to maintain its independence.) And maybe that’ll still happen…eventually. It also strikes me as odd that Marika doesn’t seem to have ANY curiosity about her father, especially considering that Griuer has brought him up so glowingly a number of times. At some point that starts to seem simply unrealistic. And one question that’s still hanging open from Episode 1: WHO was gunning for Marika from the very beginning, and why? I can’t believe these are red herrings that are just gonna get dropped down the memory hole. If this turns out to be THAT kind of show I will be very surprised, and VERY disappointed. Hopefully, I’m just jumping the gun a bit. If there are 26 episodes then it would make sense for next week’s episode to be a wrap up of the Golden Ghost arc. There might be some more to learn about the politics coming soon. I have noticed that, except for that first episode, shooting ‘in anger’ has been extremely rare; and even most of those where warning or disabling shots (again, except for the one scene in the cafe). I didn’t realize just how deeply ingrained the expectation of violence is until this episode. Maybe that’s something this series is trying to point out to the audience? Something to think about anyway. As for Marika’s apparent disinterest in her father, I think there’s a combination of things going on. The biggest being that Marika is very much her mother’s daughter; to her, Ririka is both mother and father and the one she most wants to be like and to make proud of her. The second is that she’s been shown to be pretty pragmatic and practical, and able to set aside her personal feelings to focus on her duties, which right now are school, piracy, and her cafe job. I think once she’s ‘caught her breath’, her curiosity will come forward. There also might be a reluctance to learn more about another ‘bigger than life’ example she’ll try to live up too; Marika’s shown quite a bit of self-awareness about what drives her. I’m going to sit back and enjoy the ride, though. Because this show has consistently surprised and confounded me. I really like that this show is downplaying violent solutions. For one, it’s realistic. For another, it shows creativity on the part of the writers and how the characters are portrayed. The threat is always there, the characters are always ready for it and they’ve shown they can respond with such when needed, but they’d rather avoid it, just like (most) real people. Very good point. We usually get the “violence solves every problem” story, so a show that provides alternatives is truly fresh thinking. I accepted and appreciated her not getting “hung up” on her Father — as most animae characters predictably would — but with the Princess bringing it up repeatedly, it would seem that at some point Marika would ask about it (even if only to be polite!). But her “putting that aside” for the moment, and going back to it later, would seem a reasonable behavior, given what we’ve seen of her character and personallity. In a sense I understand thinking that it is strange that Marika doesn’t show interest in her father, but it does seem that she never gave much thought to him from the beginning. If I remember correctly, she didn’t even recognize his name when Misa and Kane show up. As Uldihaa suggests, Ririka seems to be both mother and father to her. 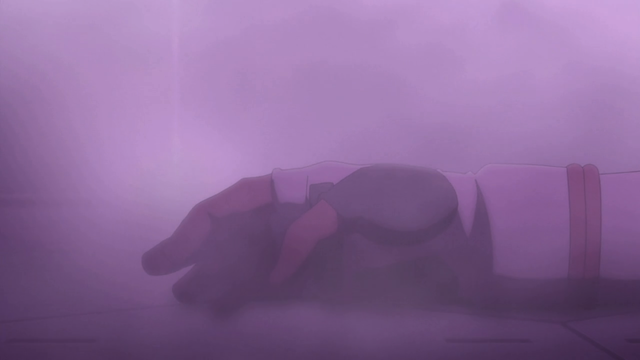 Who knows, maybe we will be getting more information on this in episode 13 as well. I’ve gotta agree there. I really like Chiaki Omigawa’s work. The B-Pirates OST includes a “radio drama” and I keep listening to it, despite the fact that I don’t understand what anyone is saying, because Chiaki Omigawa is so expressive. Hearing her just makes me laugh. In fact, I also just ordered And Yet The Town Moves (SoreMachi). It will be interesting to see if we get any more information about the political situation in the next episode. The more I think about it, the more I am convinced that it is a continuation of the current arc, even though the climax seems to have passed. They certainly wouldn’t be starting a new arc at this point in the season.